Custom ordering is the future of Quick Service. ICC's goal with the Special Order Screen was to create a custom order kiosk at an affordable price. 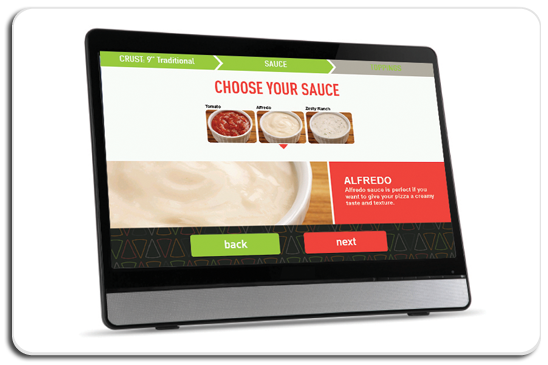 The Special Order Screen™ allows customers to create a fully customized order at their fingertips. Once their order is completed, it is be sent to the Buffet Minder™ kitchen screen, which signals staff to start the order. Order pagers can be added to the system which allow staff members to locate and deliver custom orders to customers seated in your restaurant. This convenient system is at affordable price points and bring your food service to the future. Studies have also shown, customers provided with a kiosk trend to order MORE when given limitless options. Add convenience for your customers while increasing your bottom line.